I read an interesting article in The Economist this week regarding LNG exports in the US. This is a rather interesting article, so please read the full version for yourself. Years ago, when the US thought they would have to import LNG’s from abroad there was a massive build out of over 24 LNG plants for regassification. Thanks to horizontal drilling and hydrologic fracturing, the US will not have to worry about LNG imports for the next century at the earliest. Converting these regassification plants to be export terminals makes economic sense and environmental sense. With the exception of Sabine Pass in Louisiana who was just recently granted permission to export, all that equipment now sits idle along the gulf coast. At the heart of the issue is the fact that American gas now sells for $3.40 per MBTU domestically but over $12 in Europe and up to $20 in Asia. 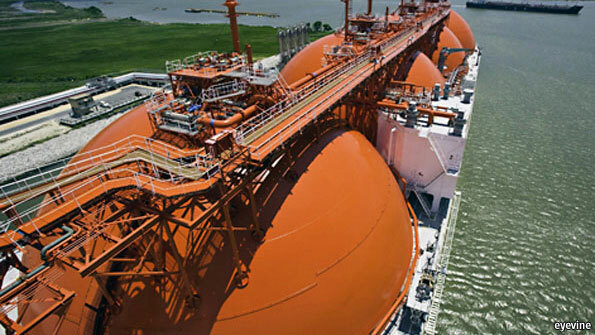 Turning American nat gas to LNG cost about $5 per MBTU, so exports of LNG can be beneficial to the economy. Furthermore, the glut of natural gas has actually forced producers to stop producing until the supply dwindles or demand picks up. Tapping the international markets would allow this process to balance out. Of course, there is steady opposition to LNG exports from uncommon bedfellows of environmentalist and business proponents who respectively oppose fracking on environmental grounds and who want to maintain their access to cheap fuels. Nat Gas is priced on a regional market as opposed to a global market. The lack of export infrastructure acts as a subsidy thereby keeping the price of gas artificially low and promoting inefficient use of the fuel. Increasing LNG exports will increase the price but will hopefully establish a free and transparent market. The revenues of the fuel trade should be used in clean technology research and developing next generation technologies. With cheap nat gas prices in the USA, developing nations have been leaning towards coal to fuel their consumption. Access to natural gas will hopefully reduce the emissions in the developing world more than if the gas were kept in the US. These two points rely on the assumption that fracking remains legal. 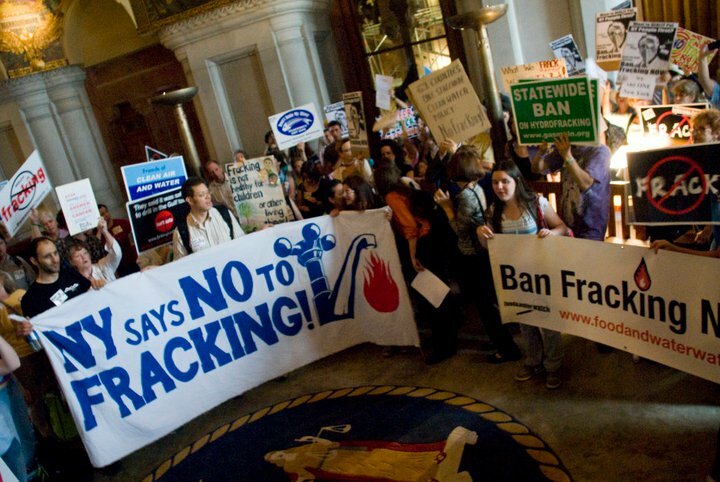 As I write this, a moratorium on fracking (bill A.5424-A) was just passed by the Assembly and will go before the NY State Senate and then on to the Governor for signature. Clean technology has never been more affordable or accessible to the masses. Policy makers are now realizing the national security and economic concerns of relying on fossil fuels. Clean, distributed sources of energy combined with sustainable development are our best options for a healthy, prosperous future. If you have ever wondered how much energy is wasted in the United States, then look no further than this chart from the Lawrence Livermore National Laboratory. 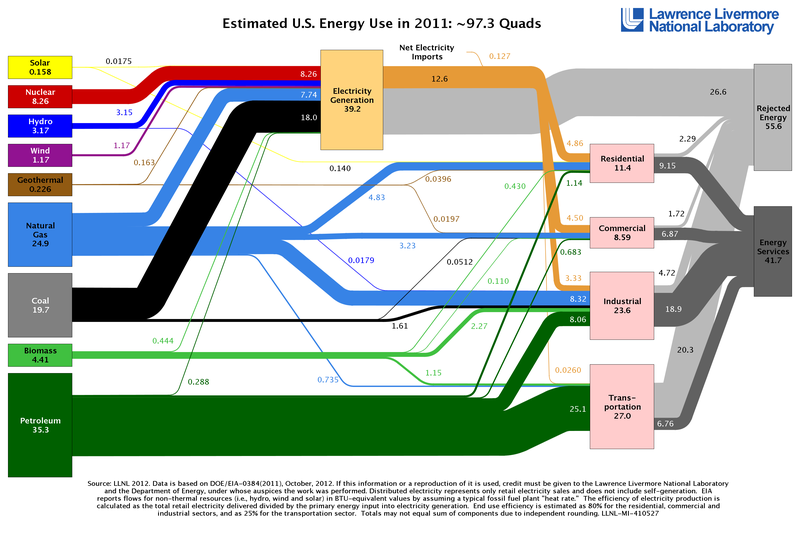 What your are looking at here shows how many Quads (Quadrillion BTU’s) of energy is produced from each source of energy . . . and how much is wasted through inefficient processes or simply lost as heat energy. 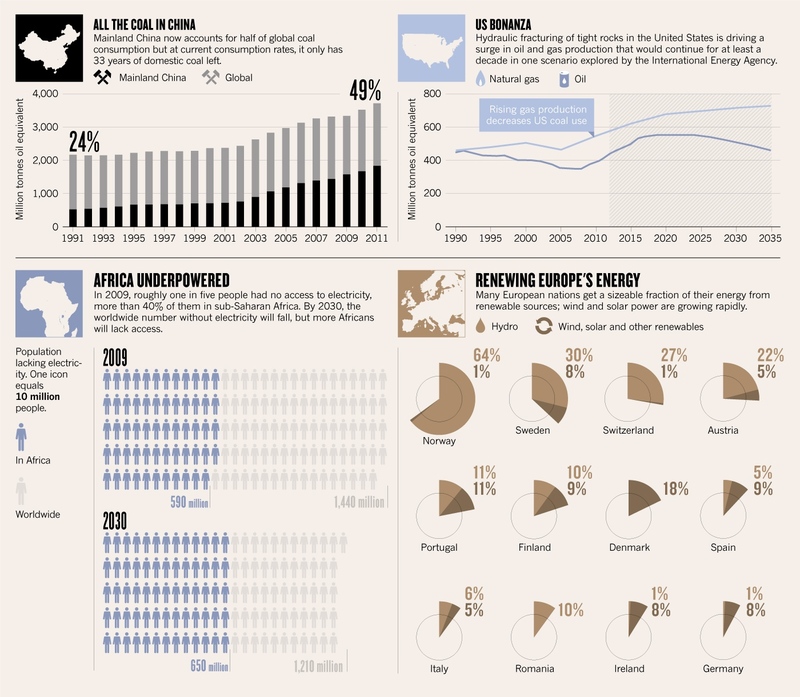 In 2011 more than half (57%) of the energy produced was rejected. In terms of electricity generation, almost 2/3 of the potential energy is lost. Cogeneration plants achieve a much higher efficiency level than conventional coal or natural gas plants. In the transportation sector the efficiency ratio is even worse with only 25% of the energy produced actually being used. If there are any entrepreneurs out there, I see many opportunities for improvements here. In fact, I think this chart could show the next trillion dollar opportunity! To stress his point, Mr. Obama directed Congress to come up with “market based solutions” (think cap and trade) to climate change or else he would step in with an executive order. The bill that Obama mentioned was the 2007 Climate Stewardship and Innovation Act that proposed a reduction to 2004 levels by 2012, 1990 levels by 2020, and 60% below 1990 levels by 2050. This can be done. We need to evaluate how we use energy and how we can make our products more efficient. As any homeowner knows, wasted energy is wasted money and right know we can’t afford it. First, let me start off by saying Happy New Year to all the Greenbacker’s out there. I apologize for the wait in between posts but it has been a crazy couple of weeks. Anyway, a few months back BP published their annual BP Review of World Energy 2012. Below are some key charts created by Jeff Tollefson & Richard Monastersky and published in Nature.com. This chart shows the largest energy users as well as the relative breakdown of their energy supply. Two spikes are clearly noticeable – the US and China. Notice that the US is reliant on coal, oil, and natural gas for a majority of its energy needs while China is heavily dependent on coal, with oil coming in second. The recent boom (no pun intended) of natural gas supply in the US has not only dropped the price of natural gas domestically, but also explains the price decrease of coal. Economics proves if the price of x falls, the price of a substitute of x will also fall in order to keep demand steady. In effect, the benefits of cleaner burning natural gas are offset by increased use of coal in other countries. The above graph simply illustrates world energy use in million tons of oil equivalent. The final scenario shows what energy consumption would look like if we were to keep the 450ppm limit on carbon emissions. This last graph shows several interesting figures – the most interesting in my opinion is that China alone accounts for 49% of global coal consumption. However, China’s rise these past three decades has been simply amazing. Already there are more than 170 cities in China with populations over a million. Fueling this rapid expansion will require significant increases in coal, oil, natural gas, and renewable energy. By leveraging the power of new technologies and global markets, renewable energy can compete with fossil fuels. Lets hope that renewable energy plays an even greater role in mankind’s future than current trends predict. In 2011, fossil fuel subsidies grew 30% to $523 billion while renewable energy received just $88 billion. The US will become the largest oil producer by 2017, a net exporter of natural gas by 2020, and will be almost energy-self-sufficient (in net terms) by 2035. Global oil demand increases by 7mb/d to 99mb/d in 2035 at which time price reach $125/ barrel (real terms) = (over $215/ barrel nominal terms). The gas boom in North America will reverse the direction of the international oil trade, with almost 90% of Middle Eastern exports destined for Asia. Natural gas demand increase by 50% in 2035, with most of the production coming from the US, Australia, and China. By 2035 we can achieve efficiency savings equivalent to 20% of global demand in 2010. By 2015 renewables become the world’s second-largest source of power generation, closing in on coal as the primary source by 2035. Global oil demand would peak by 2020 and be 13mb/d lower by 2035. Energy sufficiency does not mean that we will be insulated from the price spikes on the global market. Approximately 55% of America’s energy self-sufficiency is from increased production – the remaining 45% is from increased energy efficiency measures such as better gas mileage in cars and trucks, more efficient buildings, and smarter appliances. Electricity prices in the US will be about half that of Europe as power plants switch to cheap natural gas. This will be a huge boom for the economy as heavy industry repopulate parts of the mid-west. However, in terms of climate change, increased use of natural gas will be offset by increased coal usage in the developing world. Finally, and very sobering, the report concluded that the unless a global emissions agreement is implemented by 2017, the planet will not remain within the 2 degree Celsius range that most scientists agree is the upper safe limit on warming. Congratulations! We are finally out of this election cycle and all the negative ads. And no matter who the winner is, I hope that we can all come together to build a stronger economy and a healthier society. While we wait for the mudslinging over the fiscal cliff to begin, here are the top four recommendations on climate change policy for the incoming (or returning) president as stated in Businessweek. 2) Cut Non-CO2 Greenhouse Gases. CO2 is obviously the biggest contributor to global warming, accounting for over 80% of GHG’s, but it is not the most potent. Other GHG’s such as Methane, Nitrous Oxide, and other flourinated gases such as hydrofluorocarbons, perfluorocarbons, and sulfur hexafluoride are numerous time more potent warmers than CO2. I wrote a paper on this earlier this year and will post it later this month. Needless to say, focusing attention on these High Global Warming Potential gases may do more in the short-term to curb warming and create some international “good will” for tackling the CO2 problem. 3) Promote Clean Energy and Energy Efficiency. The administration should further the transition to renewable energy sources by removing subsidies for fossil fuels and encouraging smarter subsidies for clean energy. I wrote extensively on this subject here. In short, current subsidies to fossil fuels should be removed and invested into R&D. The current subsidies in place for renewable energy promote widespread deployment of these technologies, but do nothing to increase their output and reduce their cost. A better subsidy policy would promote increases in efficiency or reductions in cost in order to make these technologies competitive with cheap and abundant natural gas. After all, the taxpayer wants to see results from their money. There you have it. In only a few hours from now we will know the next leader of the United States of America. Now if the time for action on climate change. The four steps outlined above are only the beginning, but they will help to reduce our dependence on fossil fuels, improve the health of our citizens (and the other 6.7 billion citizen of this planet), and even provide opportunities for the growth of new industries. This is a tall order, but we have never backed down from a challenge before, why start now? No, the title of this post is not just something I heard uttered by a disgruntled Red Sox fan on our road trip to Boston this past weekend. It actually has to do with Governor Andrew M. Cuomo’s decision to begin a new environmental study of the effects of fracking on public health. This decision would restart the regulatory process and almost certainly push a final decision into 2013 or later. While a big victory for the environmentalists, it has angered upstate residents and land owners who were looking for economic development or to simply lease out their land to natural gas companies. Mr. Cuomo is caught between a rock and a hard spot on this issue because of his committment to economic prosperity and job creation on one hand, and his environmental conservatism on the other. With both sides fervently pushing to allow or deny fracking on the New York region of the Marcellus Shale, the Governor decided to review more data and let the facts make the decision for him. America really needs to learn the facts about natural gas – do not base your decision on a 30 second tv commercial sponsored by the Natural Gas Alliance. Get out and do some research. This is such a big deal for America’s economy and our environment. If fracking is for the public good, then a public health study of the effects of fracking is exactly what the doctor ordered. FULL DISCLOSURE: I must admit that I was originally in favor of fracking in certain areas and more importantly, in favor of natural gas as a “transition fuel” until renewable sources were cost competitive. 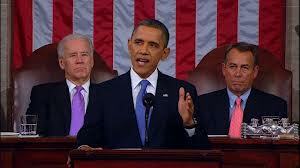 I saw the economic benefits and job creation associated with fracking as outweighing the environmental degradation. Since then I have changed my opinion. I have to ask myself, why are we taking a bunt when we could be swinging for the fences in terms of renewable energy technology. Natural gas will still play a large role in America’s future – after all, we need a diversified energy portfolio. But now I see the economic benefits of renewable energy technology being even more important to our economy. Instead of risking potential poisoning to our fresh water supplies and still being dependent on the spot price of a commodity, our renewable energy future will protect our most vital resources and at the same time create a demand for good, high-paying jobs in science, engineering, and operations and maintenance of distributed, renewable energy systems. Mr. Greenbacks Goes to Costa Rica! 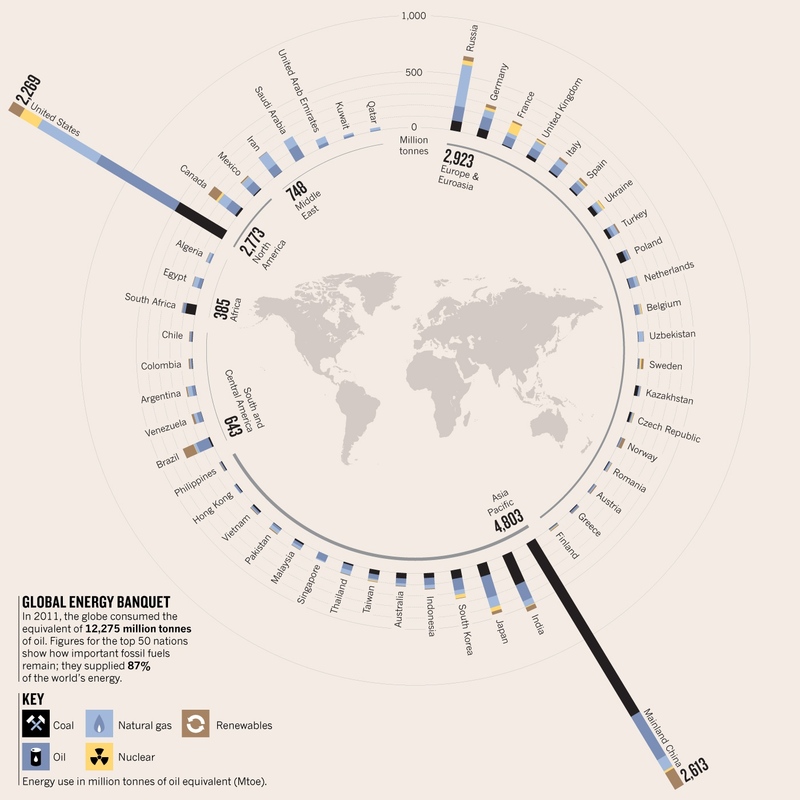 How Much is Climate Change Costing Us? In His Own Words . . .